And here’s another cover image, which I forgot to tag onto the previous post. 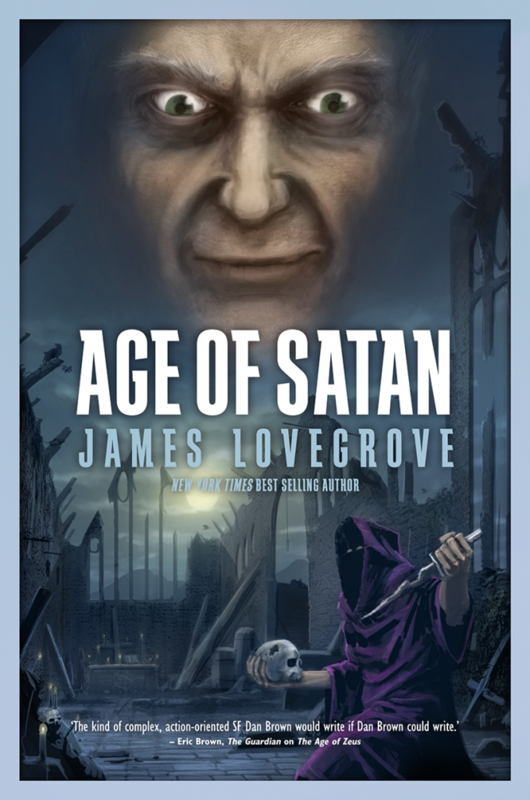 It’s for the Age Of Satan ebook, and thus devilishly good little number comes courtesy of Mr Simon Parr. I picked up “Age of Odin” around New Year’s and have since devoured every Pantheon book including “Age of Voodoo.” I just wanted to drop you a quick line and thank you for one of the best reading experiences I’ve had with a series in a long-time. I’m naturally excited for “Age of Godpunk” and “Age of Shiva” but for now I’m going to try the “Redlaw” books as they sound amazing too. I’ll also politely keep my fingers crossed for a Celtic, Chinese or Japanese “Patheon” book(s) and/or more Team Thirteen appearances. I think all of the above would be a lot of fun to write. Other than that, I was curious if you’d share some tips for aspiring fiction writers in a future blog. I’m a freelance journalist and have been looking forward to making the jump for a while now so any advice you can give is greatly appreciated. P.S. One of the things I freelance about is heavy metal music. Given “Age of Satan” is a pretty metal idea, I hope you don’t mind me leaving a link! The Celtic pantheon keeps coming up as an idea, both here and elsewhere, and I’m not discounting doing it. I certainly haven’t closed the door on writing further Age Of… books. I just want to take a short break after Shiva to concentrate on other things. New projects, fresh fields, different horizons. As for Team Thirteen, the problem there is that there’s another guy, Weston Ochse, who’s come up with a very similar idea simultaneously with me and started a whole series of novels. That isn’t to say I don’t have idea for T13, just that I’m wary of covering the same ground someone else is. I’ll happily do a blog for you sometime. I don’t know much about making the jump from freelance journalist to author, because I did it the other way round: I was an author before I started doing freelance journalism. But I do know a bit about fiction writing, and I can bore the ears off anyone on that topic. Nice site, by the way. Wish I was more of a metal fan myself. Much cooler. I prefer my rock to have string arrangements on top, unfortunately. And keyboards. Lots of keyboards. Thanks for the kind words! They’re greatly appreciated. It sounds like there are lots of interesting things you’re working on now unrelated to the “Pantheon” series and I’m looking forward to seeing what you create next. That Sherlock Holmes title, for example, sounds pretty epic. I’ll keep my eyes peeled for your blog on fiction writing tips. It’s pretty amazing that a published author like yourself keeps up with your fans so readily. Thanks for that! P.S. There’s actually lots of symphonic metal out there that’s heavy on the strings and keys. Some of it is pretty extreme (say symphonic death metal) but there’s some borderline neoclassical stuff out there too that’s much more accessible if you aren’t used to the really brutal stuff. Certainly I should think about doing a “tips for aspiring writers” piece on my site, but I can easily boil it down to a couple of very short sentences. Read lots. Write lots. That’s all there is to it. The rest (publication, sales, readers) follows in due course. Brutal metal definitely isn’t my thing. I’m an old-school prog fan and also like arty white-boy rock, stuff like Bowie and The Divine Comedy, and the classic ‘eighties electro pop. Can’t help it. It’s what I was into when I was a teenager, and that music stays with you, no matter what. That sounds like very sage advice. Out of curiosity, though, are there certain things you do when writing longer works – do you schedule time to focus on just that, outline entire plots beforehand, work in a particular place or way? And as far as reading lots of things, how do you keep an original voice when there’s so many good books out there? P.S. You can never go wrong with Bowie! With novels, I tend to write an outline that can be anything from 5 to 10 pages, plus a few pages of notes, and then I just sit down and start. It usually takes three to four months till I reach the finish, and along the way there’ll be detours into areas of plot that I didn’t foresee and new characters will present themselves and demand to be included in the proceedings. I’m sure I could complete a first draft more quickly than that, but I have other additional jobs such as reviewing and manuscript mentoring which make demands on my time. I like my outlines to be reasonably loose, with flexibility built in, because by the time I’m halfway through writing a novel I’ve usually strayed pretty far from the original storyline already, and the ending usually comes as a complete surprise. That’s the fun of this job. As for reading and keeping an original voice, it’s inevitable that aspects from a book I’m reading creep into what I’m writing, but I try to keep it to a minimum and if I’m going to use something from someone else’s novel I’ll steal it wholesale, blatantly, and hope no one notices. Sometimes it can be the tiniest thing, like a single, apt word which I like the look of, and sometimes it can be an attitude, a way of tackling a certain type of situation. I’ve loved Bowie’s music since I was 9 and first heard “Space Oddity”. The new album is a slow grower but I’m liking it and I’m just so damn relieved he’s broken his decade-long silence at last. The Team 13 idea immediately made me think of the Cthulhu mythos. Have you given any thought to an “Age of Cthulhu” book? Not a bad idea, Michael. The Cthulhu mythos doesn’t really fall into the category of established pantheons, but Team 13 versus Cthulhu and his mindless hordes definitely has potential. I know my editor at Solaris would go for it, him being a huge Lovecraft fan. Just a cautionary note. Please, if you do anything in regards to Lovecraft or his creations, don’t take away the mystery that Lovecraft himself intended for each of his stories. He purposefully left out details so that the reader could fill it in with his/her imagination. Being a fan of Lovecraft I am often disappointed when another author or movie maker feels the need to improve upon and/or twist Lovecrafts creations. Instead they often botch the entire process. I agree about Lovecraft. There’s been a lot of Cthulhu mythos stuff published, probably too much, and new interpretations tend to add little. I like the way Mike Mignola has incorporated some of the material subtly into his Hellboy universe, and Neil Gaiman’s story “Only The End Of The World Again”, set in Innsmouth, is a pretty good take on Lovecraft. I’ve even done one myself (“The Aklo Intelligence”) in the ebook anthology World War Cthulhu, but in that I concentrated on HPL’s invented language more than his better-left-unseen monsters. And thanks for letting me know how much you appreciate my books, Dan. I try my best, and it’s deeply rewarding when someone tells me they enjoy them.